I have two definitions of history: one is what happened in the past; the other is the story we tell about what happened in the past. The second is always an incomplete summary of the first, an interpretation meant to make sense of the available evidence. The further we move from a point in time, the more the story gets muddled, and like DNA, any error in the coding gets passed down to future generations. Digitized history books and old newspaper articles are now remarkably easy to access, however, often these contain speculative history or are based on a misreading of the facts, yielding the historical equivalent of "fake news." “The Castello Plan” of New Amsterdam shows the wall as it was circa 1660. Reproduced from the Iconography of Manhattan Island, I.N. Phelps Stokes, 1915. Consider the Wall…In 1653, the Dutch colony of New Amsterdam built a fortification along the northern edge of the town, running from the Hudson River (today's Greenwich Street) to the East River (then lapping at Pearl Street). As we now can prove, this wall was originally built to protect the City from the English (previous post). Eventually the English captured the city, and named the street that ran along that old fortification Wall Street. But what did the Dutch call it? In a prime example of a misreading of the historic record, one of the more common Wall Street myths circulating on the Internet is that the Dutch called the street de Waal Straat. Another myth is that the street was only named Wall Street after the wall was removed. An even more absurd myth is currently gaining traction: Hollanders think the street name is derived from a slang word for French-speaking Walloons. The source of this myth notes that the Dutch word for a wall is wal, not waal. A New Map of the City of Amsterdam, 1720. Note how the bastions (bolwerks to the Dutch) of the outer wall resemble those of New Amsterdam. Map courtesy the Stadsarchief Amsterdam. Sounds reasonable enough, but, in the original records of New Amsterdam, the Dutch never refer to the wall as "the wall," or a wal; they wrote of the palisaden, palisades, or werken, works. The meaning is the same in Dutch as in English: the "works" of a city mean its fortifications. Oh, and the street that ran along the Wall, well I hate to break this to you, but the Dutch did not call it Wall Street, or even Waal Straat, they called it Het Cingel. Pronounced Single, in Dutch it would have meant “the belt,” but it was often used in reference to the fortifications of a city. The Cingel or Cingle would have meant not just the street, but the wall, and the ditch or canal that also formed part of the defense. The Singel is also the name of a street and canal in Amsterdam, once along the border wall of the town. The residents of New Amsterdam were intent on modeling their new town after their homeland. They used the same system of government, they built canals (named after canals in Amsterdam) and they named their streets after streets in Amsterdam. An English visitor to Amsterdam in 1803 reported that to the Dutch the word Cingel conveyed the meaning “a Walk [meaning a path, not the verb] round the Walls of the town.” (The European Magazine and London Review, Vol. 43, p. 338, May 1803) Many other fortified Dutch towns still have a Singelstraat near the old city walls. 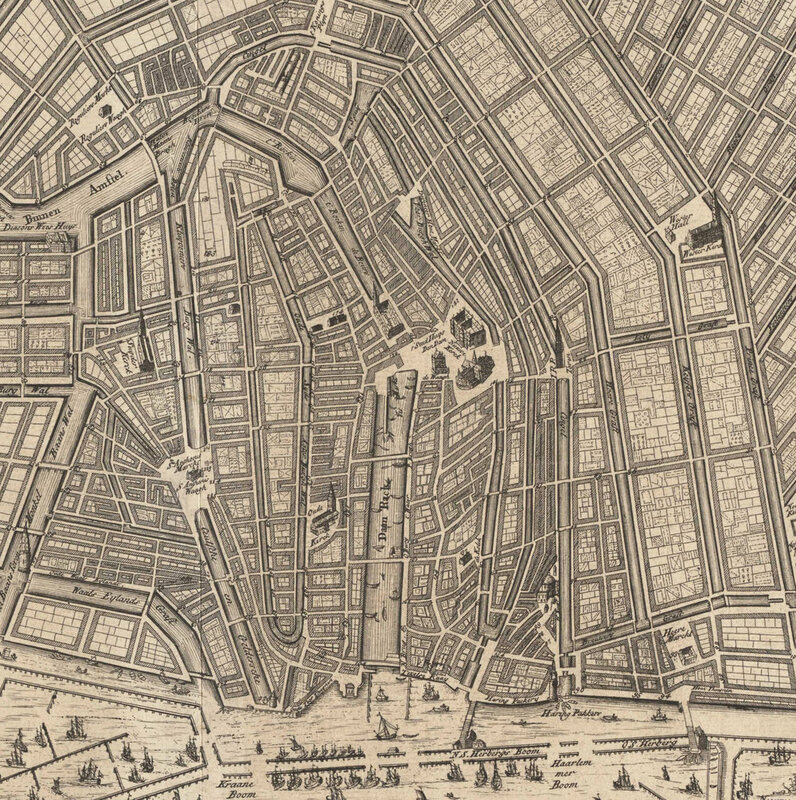 A New Map of the City of Amsterdam, 1720 (detail). The Cingel is the canal (and the streets on either side) that begins at the “Haring Pakkers” by the waterfront, heads up to the tower, and then curves to the left before joining the Amstel River. It was the original defensive wall of Amsterdam. Map courtesy the Stadsarchief Amsterdam. Map showing the placement of the wall in relation to modern streets. The Wall did not just run along Wall Street, it also ran along the western edge of the City along the path of Greenwich Street, and at times along part of the East River. On the eastern shore a small earthworks with cannon protected the Stadthuys or City Hall. The wall had a gatehouse at Broadway, “The Land Poort” on this map, and a fortified gatehouse at the water’s edge “The Water Poort.” Stokes, Iconography of Manhattan Island. Now I fear I am really going to confuse you, because there was a Waal Straat in New Amsterdam, and a waal, but it is not what you think, although you can still walk it today. Stand at the corner of Broad Street and Pearl, let your imagination strip away the high-rises and picture the scene in the 1650s. Broad Street is a canal; originally a muddy cut known as the Ditch, now lined with posts and planks, it has three lovely wooden bridges, and is known as the Heere Gracht. Again, the residents evoked their homeland, naming this canal after the Heere or Heeren Gracht in Amsterdam. Heeren means Gentleman or Lord, so the Gentleman’s Canal is the standard translation, but it also implies a sense of grandness, and Heeren Wegh was the Dutch name for Broadway (sorry Wikipedia, wrong about that too). Head north along Pearl Street—in 1653 this would have been the Strand or wael, the riverbank—in the sidewalk, below glass panels, you can see a foundation of old New Amsterdam. Dug up in the 1970s, it is from the tavern to the left of the Stadt Huys, the first City Hall (modern yellow bricks on the sidewalk indicate the outline of the Stadt Huys). In front of the Stadt Huys a small bulkhead was constructed, to protect against the tides, and cannons were installed to protect against the English. The plank waal in front of the Stadt Huys and the battery, in an early-20th-Century interpretation. Stokes, Iconography of Manhattan Island. The battle with the East River tides is constant, and in 1656 all those living along it are required to add wooden piles and planks to establish a bulkhead. This bulkhead the Dutch called a waal, or wharf, and it would run from the Heere Graft (now Broad Street) to Het Cingel (now Wall Street). In time the path along it would no longer be called the Strand, but de Waal Straat. In conveyance records from 1667 it is variously described as "the St. commonly called the Waal," and "the Waal or place where the ships ride at anchor on the East river." (Stokes, Iconography of Manhattan Island, p.409) In Amsterdam, the Oude Waal still exists as a waterfront dock. A tax assessment for lodging English soldiers taken in April 1665 shows the use of "De Cingle" (also known as the Stadt Wall), and De Waal, but makes a distinction between the Waal and those that were "by the water" and on Pearl Street. How do we know what these streets were called and when? 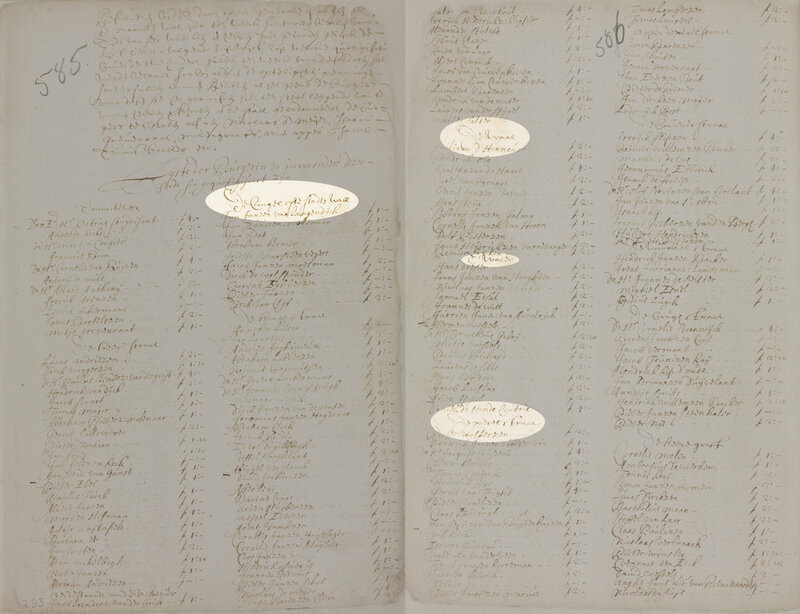 In a 1665 tax assessment from the court minutes, just after the English takeover, the clerk records those that live on "Het Cingel ofte Stadt Wall" [The Belt also known as the City Wall], and those that live on "de Waal." Interesting mix there of the Dutch word for city and the English wall. Also listed is Pearl Street, but the designation appears to refer just to the small section along the southernmost portion between today's State and Whitehall Streets. The section of Pearl between Whitehall and Broad Streets is simply called “by the water.” The only known contemporary map of New Amsterdam, the 1660 Castello Plan, has no street names indicated (it is actually a 1665 redraft of a lost original plan that probably had street names). In the 1695 Miller Plan, created after the English takeover, Wall Street is listed as "the Single or Wall" and Waal Straat (pronounce the W as a V by the way) has been Anglicized as Dock Street, a pretty accurate translation. Today we call it Pearl Street (named after its crushed oyster shell surface). New York Governor Dongan may have issued the first official designation of Wall Street in 1685, the same year he issued a new charter for the City of New York, and well before the wall came down in 1699. J.H. Innes' 1902 map of the East River shore in 1655 correctly placed the waal along the waterfront (a year before it was constructed), but makes it an extension of Hoogh Street and calls it the Cingel as well. Note the size of the ditch or dry canal north of the palisades. Innes, New Amsterdam and its People. Soon after Brower Street was paved "with cobble stones'" in 1658 and given the name that it still retains as Stone Street other streets were improved in the same way. Along each side of the Heere Gracht or Great Canal ran a street, and along the East River shore, from the mouth of the Heere Gracht to the Water Poort at the end of the city wall, a fine walk protected by the schoeynge or sea-wall of planks and therefore called De Waal or Lang de Waal. The path at a little distance from the inner side of the city wall, which afterwards developed into Wall Street, was called the Cingel. Next time: Just what was that wall anyway? A special thanks to Dennis Maika and Charles Gehring at the New Netherland Institute and Ellen Fleurbaay and Harmen Snel at the Stadsarchief Amsterdam for help with translations and other feedback. *Some later maps seem to label as the "Waal" just the portion between Hanover Square and Wall Street, but the land conveyances clearly apply the label to waterfront properties from Broad Street to William Street. Properties to the west of Hanover Square were considered to be on Hoogh [High] Street, and the few properties between Hanover Square and Wall Street were considered to be part of the Cingel. Visit newamsterdamstories.archives.nyc to learn more.